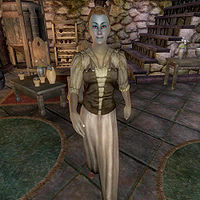 Dervera Romalen is a Dunmer publican at Newlands Lodge in Cheydinhal. She is incredibly devoted to her inn. Apart from the time between midnight and 2am when she eats a meal, Dervera spends her entire time standing behind her bar. She doesn't offer her bartering services while she eats but will rent you a bed 24 hours a day. Dervera carries no weapon, instead relying on her fists to fight. She carries a few pieces of gold and is wearing a shirt with suspenders, light brown linens, and thick cowhide shoes. She also carries the key to the lodge. The first time you talk to her, Dervera will say "Welcome to Newlands Lodge, the best place to drink in Cheydinhal. Not counting the Chapel... haha. I'm Dervera Romalen. This is a Dark Elf bar. Cursing, spitting, and screaming? No problem. Fighting is fine with me, too, only the Guard objects, and they'll fine you or lock you up. Not my call." When asked about Cheydinhal, she replies "Here you have your Chapel-going Imperials, and your Chapel-dodging Dark Elves, and never shall the twain meet. The Imperials have the gold, houses, and top spots. Dark Elves like me left Morrowind and the whole priest-ridden Tribunal nightmare, and we take the whole patriotic 'Imperial Mission' attitude with a dose of salt." Occasionally, Cheydinhal citizens can be heard saying: "Dervera Romalen is very proud of the Newlands Lodge. She seems especially happy that the Red Queen drinks there." This is possibly related to an unfinished quest intended for Unmarked Cave. Dervera seems to have been one of the NPCs involved in the unfinished "Couriers" quest. Two AI packages check to see that she is alive before running: one is still used by Ra'Jhan, but the other is unused. Despite the fact that Dervera says she doesn't mind fighting, she will still react to crimes like most other NPCs and she will still call the town guards in case of any lawbreaking. This page was last modified on 18 October 2018, at 05:35.